With gasoline prices topping $4 per gallon the Los Angeles County Metropolitan Transportation Authority (Metro) stresses now is the perfect time to try bus, rail or vanpool to discover how much money and time can be saved compared to driving. National Dump the Pump Day, June 19, 2014, highlights transit as a way to help people save money. Commuting to work alone in a car costs more than the price of gasoline. Drivers have to take into account insurance, maintenance, wear and tear and parking at many destinations. For example, the American Public Transportation Association (APTA) estimates the cost of driving a car annually at $10,174. By using transit or vanpooling, commuter can save about 75 percent. “Every day, Metro puts 2,000 buses on our streets and trains on 88 miles of light rail and subway tracks. There is a very good chance that Metro has a transportation alternative that works for you,” said Metro Board Chair Diane DuBois. For commuters with a roundtrip drive of at least 30 miles, Metro also offers an extensive vanpooling program supporting a fleet of 1,331 public vanpool vehicles destined to L. A. County work sites each day. Nearly 90 percent of Metro Vanpool commuters used to drive alone and, based on ridership statistics, vanpooling results in nearly 7,000 cars off the road each day. APTA reports that in 2013, Americans took 10.7 billion trips on public transportation, the highest in 57 years. According to APTA, since 1995, public transit ridership is up 37.2 percent outpacing population growth, 20.3 percent and vehicle miles traveled, 22.7 percent. Metro bus and rail riders continue to increase in numbers. In Fiscal Year 2011, Metro had a total of 453 million boardings. In the FY2013, Metro increased that to 472.7 million boardings. APTA estimates that public transportation in the United States reduces the nation’s carbon emissions by 37 million metric tons annually, which is the equivalent of the electricity usage of Los Angeles, New York City, Washington D.C., Atlanta and Denver combined. In addition, research by the Texas Transportation Institute Census Bureau shows that in 2011, U.S. public transportation use saved 865 million hours in travel time and 450 million gallons of fuel in 498 urban areas. Metro is a multimodal transportation agency that is really three companies in one: a major operator that transports about 1.5 million boarding passengers on an average weekday on a fleet of 2,000 clean air buses and six rail lines, a major construction agency that oversees many bus, rail, highway and other mobility related building projects, and the lead transportation planning and programming agency for Los Angeles County. 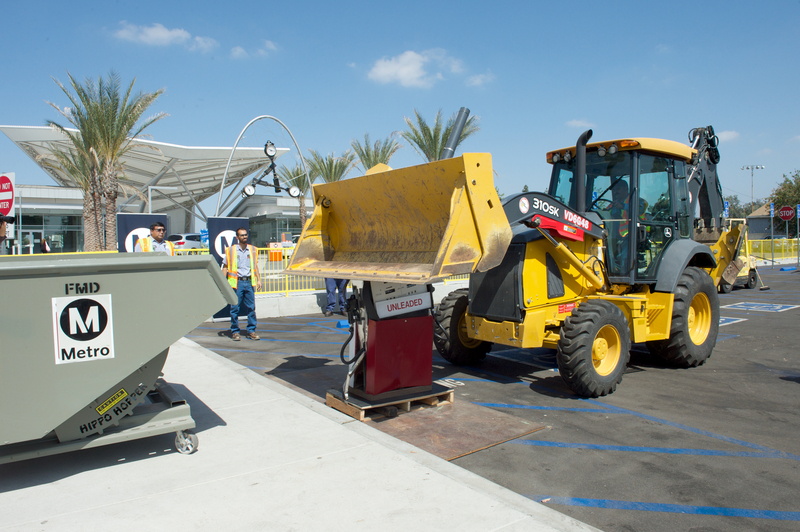 Overseeing one of the largest public works programs in America, Metro is helping change the urban landscape of the Los Angeles region. Dozens of transit, highway and other mobility projects largely funded by Measure R are under construction or in the planning stages. These include five new rail lines, the I-5 widening and other major projects. Photo by Gary Leonard for Metro. So says the transit agency which also spends billions of dollars in freeway enhancements. Don’t be fooled anyone! Metro does NOT want you to “dump the pump” at all. They happily spends BILLIONS in freeway “improvements” that do nothing but invite more auto travel and congestion while they siphon money away from any effective transit that can compete with autos. If Metro is really serious about being convincing enough to lure more Angelenos to give up driving, then they should make a good example out of themselves by forcing everyone working at Metro to take public transit. And the best way to start that is to get rid of employee parking at Metro HQ. But you guys don’t. The last time I went to One Gateway Plaza, there’s two parking spots: one for the lowly commoners and the free employee parking spaces that you give for elitist government bureaucrats. And at the same time, as the above poster mentioned, you spend billions of dollars in upgrading freeways and wasting people’s money with propaganda photos. Oh, so you took a picture of a bulldozer crushing and old gas pump? What does the bulldozer run on. Yep, it runs on gas. And how much of the people’s money was wasted on this photo op? The guy controlling that bulldozer doesn’t work for free. The gas used in that bulldozer isn’t free. And it seems like you brought in that old gas pump from somewhere since it’s sitting on top of a wooden pallet. So there’s cost there too to bring it in and you guys probably used gas driven truck to bring it out there too. Why should anyone take you seriously? You talk the talk, you don’t walk the walk. Same sentiment as above. If Metro really wants to get rid of cars off the roads, then why do they keep helping car drivers continue to drive more with freeway projects, all the while charging more to with fare hikes? What’s the point if you’re going to make people pay more to take the bus while expanding the freeway system? Smoke and mirrors! METRO is prepared to spend +$15-$30 BILLION of taxpayers’ money to build just 4 miles of toll tunnel to connect the port with the 210 Freeway. Have the Asian importers ship their containers east by rail and not clog our already clogged FREEways. don’t know if this is dump the pump day is supposed to make me drive less but when was the last time you saw an analog gas pump at a service petrol station? Certainly, pouring concrete in this day and age is a waste. It’s a question o0f funding sources, I’m sure. Certain funds for certain purposes. At least Metro is pushing mass transit as much as they possibly can. It could be worse, you could be down here behind the Orange Curtain. OCTA is terribly short-sighted and still dances to the tune of Donald Bren and the other developers. I hope you all were careful handling a gas pump of that age. It will likely be full of Asbestos and possibly also Lead. So… this year’s Dump The Pump Day does NOT offer FREE bus passage on July 19th, as it has, in previous years? Jeff, not when Metro is simultaneously expanding capacity on the freeways that parallel those routes. You cannot attract people to transit unless it competes, at least somewhat, with cars. No one is going to spend three or four times the amount of time to travel via transit when auto travel is so much cheaper and faster. If Metro was serious about “dumping the pump” we would be building a MUCH more comprehensive rail system that reaches most of the major population and employment centers throughout the County. Also, why not offer FREE TRANSIT riders on “dump the pump” day? At least that would make this whole charade a bit more credible. Didn’t Art Leahy work for OCTA? He doesn’t seem to understand what a pedestrian is and apparently only recently discovered that the bicycle can be mode of transortation. He must be ex-octa. Metro continues to lobby against changes to our dangerously de-urbanized streets that have come to resemble those in Orange County.. It is as if they don’t quite understand that people have to reach transit to in order use it. Yes, Art Leahy worked at OCTA before coming back to Metro. I don’t think it’s fair to characterize him as anti-pedestrian or anti-bike. The agency just released a new first mile/last mile plan to help cities across the region get people to transit stations and the bike program has grown considerably at Metro since Leahy arrived in 2009. There are many street projects across the region to promote better walking and biking opportunities and Metro is helping pay for them through Measure R local return funds or other grant programs. The agency may not support every single project that’s out there, but it certainly promotes many of them. I would like to respond to a number of the preceding comments. First, MTA is a county wide transportation agency. They are not merely a ‘public transit’ agency. They are dealing with the whole package. So roads are a vital part of their focus, you can’t deliver groceries to a store on light rail. Want solar on your house, the installers have to come with their tools, which means: they show up in their truck. Police, fire, dog catchers, trashmen, UPS, etc. need streets and highways to get to places. So, MTA needs to work with CalTrans (the lead agency for freeways, FYI) to make improvements. @Cynical, I think that MTA might, like many companies and agencies in DTLA, provide parking for employees, but charge them for it, but provide a transit stipend that pays for a Monthly MTA Pass, or can pay for part of the parking. Also, that is not a bulldozer, that is a backhoe. A bulldozer has a push-blade and generally has tracks. And it runs on diesel, not gasoline. @Tom Savio: The 710 tunnel is not going to be toll (and if it were, it would pay for itself). The ‘Asian importers’ as you call them are people that are buying products from stores, the end user is the one that creates the demand. The 710 tunnel is not for east bound traffic, it is for northbound traffic. There is already a huge amount that goes east by rail. @Lance: Yes, signal control by busses and trains. @Lance & Erik: That looks like a modern-ish private fleet pump. Don’t see a county Weights and Measures seal on it. Those things are still in use at Police and Fire stations, and at city yards all over the place. Happy Belated National Dump The Pump Day Of 2014! Happy Belated National Dump The Pump Day Of 2014! Yesterday was the day to literally abandon your car and the gas station and instead, be green and help save our environment by taking public transportation to all of your destinations! Taking public transportation is even way cheaper than purchasing a gallon of regular gasoline today (since in the Los Angeles County, one bus ride is only $1.50, but it will only rise up to $1.75 in September, but still, a gallon of gasoline is approximately $3.66 nowadays!) Plus, you will be able to leave all of the driving to the hard-working and diligent bus drivers, so that you can just relax and enjoy the ride, and also catch up with your tasks. In addition, you can stare out the window and tease at the people who are driving their cars to their destinations, since the bus, light rail, or subway is traveling slightly faster than them. So, without further adieu, I would like to encourage all of you to leave your cars at home, and take public transportation to your destinations instead! I also forgot to add that National Dump The Pump Day only occurs once annually, but it doesn’t matter, because everyday should be a green day, and we should all pitch in and continue to help save our environment! Take public transportation to your destinations every time, not just only yesterday, and every National Dump The Pump Day that occur annually! I live in Orange County as well. I have mixed feelings about OCTA. They run fairly good countywide local bus service. However, there seems to be little creativity. Except for the “Bravo!” line on Harbor Blvd., I know of no rapid bus lines/liners. The only dabbling into rail has been the “Center Line” several years back. How about rail line to parallel to the 405/5 from one of the Amtrak/Metrolink stations to the Blue Line Wardlow station? That could have stops at John Wayne Airport, LB Airport, Bella Terra, Westminster Mall, South Coast Plaza, Irvine Spectrum, etc.